Hi. Our names are Kane Wilkin and John Clinton, Co-Founders of InHomeSafetyGuide.org. We’d like to thank you for visiting our website and provide you with a snapshot of us. What started out as a simple family project for Co-Founder, Kane Wilkin, has now grown into the most complete and accurate source for keeping you and your loved ones safe and secure at home. 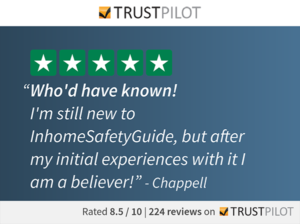 That’s what hundreds of Trustpilot customer reviews tell us today. A few years ago, Kane was searching online for a medical alert system for an aging relative. That’s when he hit all those fake product reviews clogging the internet. Knowing John’s background as a long-time product manager in Silicon Valley, Kane asked him if this was a problem that could be solved. It’s one thing to visit a website recommending the latest mobile phones, but when it comes to products and services that save lives, misinformation is not OK. The goal was simple – create a website that would offer transparent and incredibly useful product reviews to the public. Make it real, robust, and honest. That was about 6 years ago. Now, we enjoy being the most trusted source for real, bona fide product reviews. We don’t just collect information and write it up; we put each product or service through a battery of tests. In fact, more than half the companies we examine don’t survive our assessments. The companies that do survive our evaluations are listed and ranked on our website, with full product reviews available to you. When you purchase a product or service from one of these companies, we occasionally receive a financial thank-you from that company. Your purchase through our website is how you help keep this website up and running. Allow us to thank you for that.